Often the most precise and reliable chronometric dates come from written records. The ancient Maya Indian writing from Central America shown here is an example. The earliest evidence of writing anywhere in the world only goes back about 5000 years. Paleoanthropologists frequently need chronometric dating systems that can date things that are many thousands or even millions of years older. Fortunately, there are other methods available to researchers. 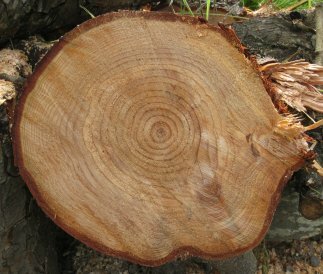 One of the most accurate chronometric dating techniques is dendrochronology , or tree-ring dating. It is based on the fact that annual growth rings under the bark on shallow rooted trees vary in width with the amount of water available each season and with temperature fluctuations from winter to summer. All trees of the same species in an area usually have roughly the same pattern of growth. Since weather patterns tend to run in cycles of a number of years, the sequence of tree-rings in a region will also reflect the same cycling, as illustrated by the graph below. The changing pattern of tree-rings provides the basis for a calendar that is often accurate to a single year. By cross-linking core samples from living and dead trees, a master sequence of annual tree-ring widths can be compiled. Each region has its own unique master sequence since weather patterns are not the same from one area to another. Ancient log samples can be compared with the master tree-ring sequence to date them to the year that they were cut down. In the case of the sample below, the tree died in 872 A.D. Unfortunately, no tree-ring sequence goes back in time very far. As a result, dendrochronology is primarily used for dating comparatively recent sites. In Northern Europe, the master sequence goes back just over 11,000 years using oak and pine trees. In the American Southwest, where dendrochronology has been used most extensively, it goes back less than 3,000 years using Douglas fir trees and 8,500 years using bristlecone pines. However, the longer bristlecone pine sequence is of little value except for cross-checking the reliability of other dating techniques because logs of this species are rarely found in association with ancient humans. Amino acid racemization dating relies on a biochemical clock that can date much older events than dendrochronology. It is based on the fact that amino acids (the building blocks of all proteins) exist in two mirror image forms, both of which otherwise have the same chemical structures. The L-amino acid molecule form has an extension to the left, while the D-amino acid form has an extension to the right. The L-amino acids change to D-amino acids more or less steadily following death. This process is called racemization. As a result, remains of organisms that died long ago will have more D-amino acids than ones that died recently. Aspartic acid (one of the 20 amino acids) is usually extracted from samples for this dating technique. The L- and D-amino acid ratios are determined by gas and liquid chromatography. Amino acid racemization can be used to date organic materials such as teeth, bones, fossilized feces, egg and mollusk shells, plants as well as peat and calcium rich soil sediments. Dates as old as 200,000 years have been obtained with this technique; however, it has been used mostly to date in the 5,000-100,000 year range. It is limited by the fact that the racemization rate varies with the kind of amino acid as well as the soil acidity, temperature, and humidity where the sample was found. The potential variation in the racemization rate has led some paleoanthropologists to consider this dating technique relative rather than chronometric. It is, perhaps, best considered to be a calibrated relative dating technique which puts it somewhere between relative and chronometric methods. Materials that can be dated include volcanic rock and clay or rock that has been exposed to high temperatures. The iron mineral particles of clay and some types of volcanic rock normally acquire a weak permanent magnetism when they are heated to a red hot state and then cooled. Such a condition can occur in a pottery kiln, a bonfire, or a burning building. Likewise, it can occur in molten rock from a volcano. Before clay is fired and while lava is still in a molten state, the very weak magnetic fields of individual particles are randomly oriented. Heating to above 1100° F. (600° C.) causes them to align their fields with the far stronger magnetic field of the earth. After cooling, this thermoremnant magnetism will remain as a permanent record of the direction of magnetic north at that time until the material is reheated or broken up. When a potential paleomagnetic dating sample is found, the present angle of declination to magnetic north is recorded relative to the sample's position in the ground. Later, its thermoremnant magnetism is measured with a magnetometer. By comparing these data, a researcher can determine the direction of magnetic north at the last time the sample had been exposed to a high temperature. The location of the magnetic north pole is known to wander about the earth's rotational north pole. It is now moving at a comparatively rapid rate of about 25 miles per year and is located just north of Canada. As a result, the direction that a compass needle points from the same location will vary from year to year as well. Thermoremnant magnetism provides an accurate record of the course of past wanderings of magnetic north. Researchers have created a map of the locations of magnetic north during the last 10,000 years by a process of triangulation from a large number of sites. The radiocarbon dating of charcoal in fire hearths associated with thermoremnant magnetic samples at these sites anchored them in time. With this map, it is now possible to determine the age of new samples that date to within this time range. The magnetic north pole has done more than just wander thousands of miles around the rotational north pole. At numerous times in the past, the north and south magnetic poles reversed entirely. A compass needle would have pointed to the south pole during some periods and to the north pole during others. Lava and volcanic ash deposits often contain the thermoremnant magnetic records of these reversals. They have yielded evidence of more than 400 reversals over the last 330 million years. The time between reversals has ranged between less than 100,000 to tens of millions of years with an average of about 300,000 years. Reversals do not happen quickly in human terms. It takes 1,000-8,000 years for one to be completed. The last reversal occurred 780,000 years ago. It is thought that as a reversal approaches, the earth's magnetic field weakens. It has been gradually weakening for the last 250 years. That may mean that another reversal is coming, but not for a few thousand years. The earth's magnetic field helps block out dangerous ionizing radiation from our sun. Subsequently, a diminishing field is likely to result in a significant rise in the frequency of radiation induced cancers in the future. When the fossils of early humans or their ancestors are found in association with volcanic deposits, they often can be roughly dated by their physical association with strata that have records of past polar reversals. However, these dates are less useful than those produced by other chronometric dating methods described in the next section of this tutorial because they usually only tell us that a fossil dates to sometime after a dated reversal and before the next one. Despite this limitation, paleoanthropologists have found dating by association with polar reversals to be a helpful additional method of tracking the evolution of our fossil ancestors in regions such as East Africa where there has been frequent volcanic activity leaving clear thermoremnant magnetic evidence. Copyright © 1998-2012 by Dennis O'Neil. All rights reserved.